Today is the Roman Catholic feast day for “Our Lady of Fatima”. 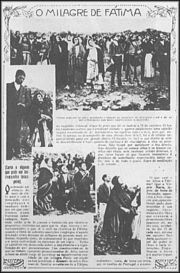 Between May 13 and October 13, 1917, three Portuguese children received apparitions of Our Lady at Cova da Iria, near Fatima, a city 110 miles north of Lisbon. (See February 20 entry for Blessed Jacinta and Francisco Marto). Mary gave the children three secrets. Since Francisco died in 1919 and Jacinta the following year, Lucia, who later became a Carmelite nun, revealed the first secret in 1927, concerning devotion to the Immaculate Heart of Mary…. Pope John Paul II directed the Holy See’s Secretary of State to reveal the third secret in 2000; it spoke of a ‘bishop in white’ who was shot by a group of soldiers who fired bullets and arrows into him. Many people linked this to the assassination attempt against Pope John Paul II in St. Peter’s Square on May 13, 1981. The feast of Our Lady of Fatima was approved by the local bishop in 1930; it was added to the Church’s worldwide calendar in 2002. Sister Lucia died in 2005 at the age of 97. Of course, I do not believe that Mary actually appeared before those children, but do accept that they could have seen some type of apparition–but not one from God or Mary. In the past year, I have read a variety of views and claims related to apparitions that claim to have been Mary. Perhaps the most disturbing conclusion that I have come to is that it appears that certain Catholic prophecies indicate that apparitions of Mary will be involved in the end-times in order to convert people to the final ecumenical form of “Catholicism” that will take over the world. Mary, the Mother of Jesus and the Apparitions Do you know much about Mary? Are the apparitions real? What might they mean? Are Protestants moving towards Mary? How might Mary view them? Will false apparitions be part of the signs and lying wonders that the Bible prophecies? This entry was posted on Wednesday, May 13th, 2009 at 12:54 am	and is filed under Religious News.